Some people – like me – open their front door, look across the street and see an elderly Asian couple who doesn’t speak a lick of English and believes my five year-old son to be the devil reincarnate. Others – like VisualCV Chief Executive Officer and Co-founder Clint Heiden – open their front door to the genesis of a new business venture. And so it was that Heiden, a well-known recruiting and technology industry veteran who founded The Heiden Group in 2004, was bouncing around a new approach to how job seekers and employers connect when he spotted neighbor – and former webMethods CEO and Co-Founder Phillip Merrick. The two men met for coffee, where Heiden shared his concept for launching a company that would reinvent the resume using technologies that transform how resume data is presented, accessed and shared. Merrick, who presided over what at the time was the most successful software IPO in history when webMethods went public in February of 2000, knew a winner when he heard one, and the two men embarked on a path that led to last night’s official launch event for VisualCV, Inc. The open house launch event – hosted at the Tyson’s Corner offices of Morrison & Foerster – was an opportunity for the company to showcase its revolutionary approach to the resume as we know it, as well as to recognize and thank investors such as Heidrick & Struggles and Valhalla Partners; partners including DowJones VentureSource, The Princeton Review and Capital IQ; and of course the forward-thinking clients like VeriSign who have already begun adopting VisualCV. Meaningful feature enhancements to the traditional paper resume over the past 60 years have been, for lack of a better word, non-existent. Creative job-seekers looking to differentiate their presentation and content from the pack have been limited to swapping egg white paper for cream-colored, or opting for the slightly thicker paper that, in reality, isn’t any more difficult for the HR Director to crumple and toss in the trash. Those truly living on the edge might even replace old reliable Times New Roman font with Helvetica. 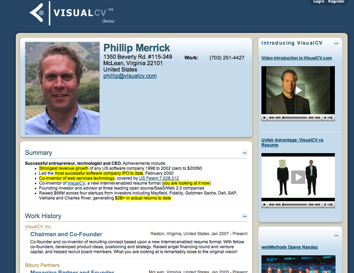 As Merrick highlighted during his ExecutiveBiz Q&A earlier this month, VisualCV allows professionals to easily build and manage an online career portfolio integrating dynamic content such as video, photos, networking functionality, references, work samples, charts and graphs highlighting achievement. For the job seeker – or any professional seeking to consolidate key text and multimedia content in one place – VisualCV also provides the necessary security and privacy capabilities. This means that VisualCV members have complete control over who views their VisualCV, as well as the privacy controls to protect sensitive personal information. And on the employer side, VisualCV seeks to bring an end to stacks of resumes circulating around offices and inherent inefficiencies built into the existing recruitment process. In speaking with Heiden (check out his own VisualCV here) last night, he pointed out that with the traditional paper resume, once it is out there professionals have little recourse to regain control over that information. With VisualCV, the professional can shut down their online profile at any point, meaning that if his employment status changes and he does not want organizations to access the VisualCV anymore, no problem. In short order, VisualCV has attracted approximately 100 organizations (the current price tag of ‘free’ helps), including familiar names in the Federal IT space such as SI International and Perot Systems. How could a government contractor, systems integrator or Federal agency benefit from VisualCV? The potential is significant given that VisualCV is as much about enabling organizations to manage their recruitment process, available talent and partner networks as it is a tool for job seekers. For example, Heiden postulated that a government contractor preparing to submit a bid for government work could access VisualCVs of employees who might become part of the team. By seamlessly scrolling through VisualCVs the contractor could determine which employees were a good fit – and available – for the contract both internally and also among its network of subcontractors. Then, these VisualCVs could be presented dynamically to the Federal agency as part of the proposal in a way that conveys the team’s skills and capabilities beyond what any conventional paper resumes could accomplish. The service is free now for both job seekers and organizations, though the company does plan to charge employers for enhanced capabilities sometime this Spring. In addition to the Internet-based portfolio capabilities, VisualCV can offer “white label” private service to organizations for capabilities such as talent management (as highlighted in the government contractor example).